Moving freely around the home is something most people take for granted. But if you have mobility issues, day-to-day tasks can present a real challenge. Moving down the hallways, getting through doorways and even leaving your home might be tough. Getting in and out of the standard bathtub or shower can also present a serious problem. That's where walk-in tubs can help. A walk-in tub is exactly what it sounds like: a tub that has a door to allow the user to walk into the tub and sit down, rather than having to step over the high lip of the tub to get in. 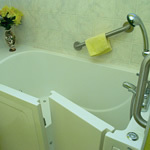 Walk-in bathtubs are perfect for those with mobility, aging or even obesity concerns. The unique design allows you to walk into the tub, close the watertight door, sit down and fill the tub to your desired depth and temperature. After your bath, you can drain the tub, open the door and simply walk out. Not much room in your bathroom? Not a problem. 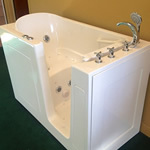 Most walk-in tub models fit in the same space required for a standard tub, so you don't have to expand your bathroom. 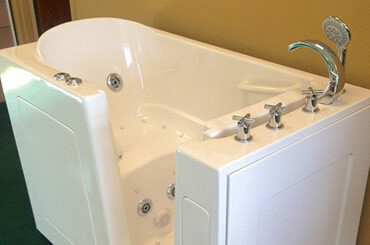 If someone in your home is elderly, dealing with painful medical conditions or has limited mobility, installing a walk-in tub could allow them to age in place in the years to come. Besides that clear advantage, remember that walk-in tubs can be used by the whole family, not just by those with health issues.